If you have watched the news over the past few years, you are familiar with drones. If the news has been the sole source of your drone information, you likely think of them as large, deadly, armed, pilot-guided warships. However, drones, also known as “Unmanned Aerial Vehicles (UAVs),” come in all sizes and perform many functions. Let’s explore how drones are used in the construction industry. Construction projects regardless of size require that contractors devote a lot of legwork to a construction project. The first use of drones in the construction industry was to survey job sites and do it more quickly and less expensively than using humans, construction tools and other heavy equipment, as well as costly tools for surveying. Some clients are not residents in the area of their project. Reports contain a lot of boring text, and pictures taken by a cellphone never do a site justice. 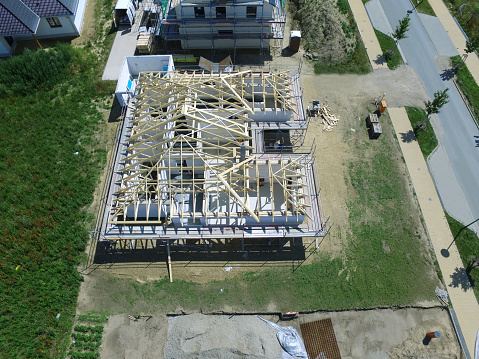 Using a drone to take aerial shots and on large building lateral shots of the building structure is an imaginative way to show clients the progress of their project. Frequently, contractors like you have more than one job going at the same time. To cut down on the amount of time you spend driving between active sites, put up a drone. That way, you can view the work as it progresses, whether safety rules are being followed, and the quality of the work being done. A drone can save you a lot of money, along with effort and time. Another important use of drones is to monitor environmental concerns. Having a drone record sediment, erosion and vegetation from the air is a valuable asset; it can minimize the need for inspections to show your firm’s compliance with environmental planning. Job site security is a key concern in the industry, and large sites may need several people on each security tour. Drones reduce the need for security by using a regular and an infrared camera to show the drone pilot if you experience a security breach. Okay, I Like the Theory, but Does It Work? Drones are already in use by construction companies. During 2015, the contractor responsible for the erection of the new arena for the Sacramento Kings, a National Basketball Association franchise, used drones extensively. These drones took photos that were later converted to 3-D images. Since there were a number of flights each day, contractors, owners, developers and financial interests could all see the progress on a daily basis. This allows for singling out areas of the project that are falling behind, so the contractors could send more resources to that part of the job site. Toy drones are not an acceptable solution. If you are serious about using a drone for your construction company, you will need one made for industry. When your drone is airborne, it should be piloted by a trained drone pilot. Drone technology is advancing rapidly in the construction industry, and in the near future, drones may be able to perform some of the tasks now performed by workers on job sites.